The black dragon pearl has a unique shape of a pearl and comes from the Chinese province of Yunnan. These hand rolled pearls consisted of both the highest quality leaves and bud. When brewed the pearls will unfurl and expands dramatically. This is a full body tea with a natural sweet taste and a coca undertone. 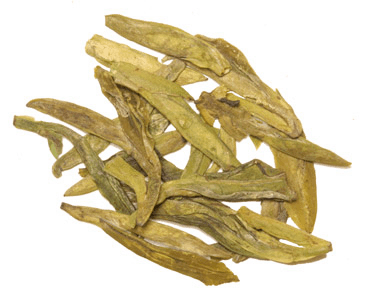 The black dragon pearl is a perfect refreshing and invigorating tea for any time of the day. This tea also allows for multiple infusions. Milk and sugar are optional. Try our Chinese Tea Sampler. A Great Value! Try our Value Black Tea Sampler. A Great Value! Very nice black tea with a slight earthy taste reminiscent of oolong, but no astringency whatsoever. Taste is smooth and full, but other than a hint of sweetness I don't taste honey or chocolate. Bought this at a local tea shop and paid nowhere near full price for it. I'm hooked!! I used to be a earl grey or english breakfast tea drinker. 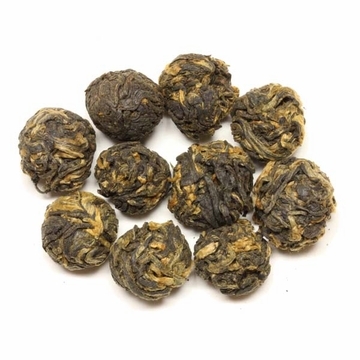 I was at a tea store and after the guy talked me into the more expensive Black Dragon Pearls, I had buyers remorse on the way home, but when I made my first cup - WOW! Worth every penny! So smooth! I have found that EnjoyingTea.com has the best price and great quality tea so I continue to buy from them. it's the best tea I've ever had Im very pleased! 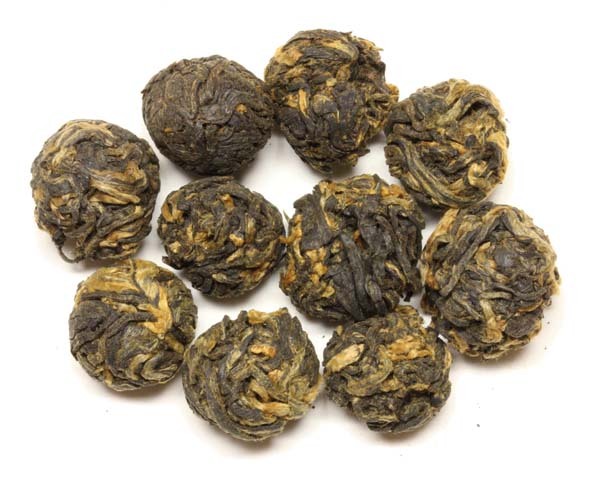 These pearls are much larger than any other "pearl" teas I have had before. I guess that's why they are called dragon pearls! 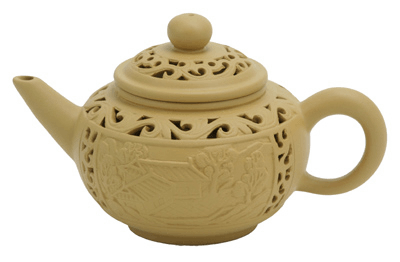 They are excellent for multiple infusions and one pearl is sufficient for a pot . It's fun to watch then unfurl. Then there is the flavor, very rich, yet not at all astringent, with a bit of a spice & honey note. A must try! Fast shipping and a discount! Products are properly package for freshness. Price is much better than the local competitors. I love these because they taste good and they are an easy way to measure the amount used. This is a wonderful tea to drink at any time of year. I definitely suggest this for folks who enjoy stronger teas! Its not bitter at all, and has a smooth finish to the taste. Black tea with a great flavor! Not artificially flavored but the texture if the tea has a chocolate rich back end! One of my favorites!! This tea is such a joy to drink any time of the day. There's enough kick to get you started in the morning, and enough flavor to be your companion throughout the day. I use four pearls per cup and usually brew two to three cups per round. This is an excellent tea. I usually enjoy black tea with milk and a little sugar. This requires none. Not all vendors carry the black dragon pearl tea. These pearls are larger than others I've purchased so I only had to use one in my teapot. A mild flavor is found in this perfectly measured tea.